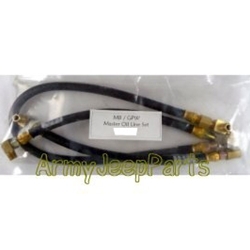 MB GPW Master Oil Line Set. These are the best quality and most accurate looking lines we can source today. The kit includes three flex lines plus all connecting fitting required for connecting to the canister plus the steel line to oil pressure gauge.